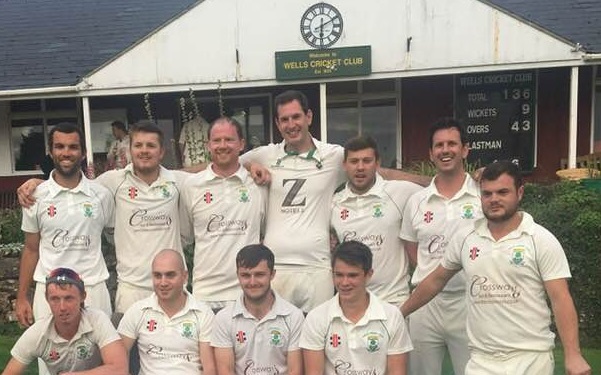 WELLS CC, on the back of winning the Somerset Division 3 title, were promoted to Division 2 and unsure what the 2018 season held in store. The first game saw Wells start the season as planned by comprehensively beating Long Sutton 1st XI at home, the highlight being a rapid 80 not out from Ben Stacey in chasing down 144 in just 24 overs to win by 8 wickets. However, the next three matches involved a thrashing at the hands of Butleigh, an 80-run defeat away to Minehead and then a 150-run defeat at home to Purnells, who amassed 358 for 9 in the process. Wells were now bottom of the league, struggling to get a team out most weeks and performances way below par as they seemed in disarray. Ollie Smart took over the captaincy, coinciding with an improved availability, and with regular first team players back, Wells’ form was to take a dramatic turn for the better. The turning point was undoubtedly a thrilling away victory over a strong Taunton side. After winning the toss and batting Wells found themselves 58 for 6 and staring down the barrel once again. They had an excellent partnership from James Dredge (39) and Jack Williams (27), who progressed the score past 140, and with some brilliant late hitting from Vince Johnson (29), managed to fight their way to a competitive 177. The strong Taunton batting line up only scored 40 for 4 from the first 20 overs and though they fought back, Wells kept picking up wickets and with 7 needed off the last over Wells picked up the final wicket to win an enthralling game by just 4 runs. Over the course of the next few weeks Wells beat Weston 2nds at home, Frome away and Bridgwater at home, all comfortably, the highlights being centuries from Ben Stacey, Harry Connock and Jack Moore. By the time Wells travelled to Cheddar, miraculously they were now top of the table. In an ill-tempered game, Cheddar scored a well over par 217 thanks in part to a poor performance in the field by Wells. Ben Stacey hit 94 as Wells eventually won by 5 wickets to cap off a good first half of the season, top of the league having won five on the bounce. In their return fixtures Wells skittled Long Sutton for 41 with Matt Rivers picking up 5 for 7. Then there was a great top of the table clash with Wells looking for revenge against Butleigh, who scored 232 for 9 off 45 overs. The Wells reply got off to a poor start but Jack Moore hit a fantastic 87 in ensuring the chase stayed on course. He was ably assisted by Vassalli (33) and skipper Smart who won the game with a 6 off the last ball. The following week Wells had yet another top of the table clash, welcoming old foes Minehead. Wells crawled to 190 all out, aided by 63 extras, then attack and fielders hunted like a pack of wolves in restricting Minehead to 127 all out for their seventh successive win. After a washout against Purnells, Wells were without Smart and Moore against an underrated Taunton. The Stacey brothers shared a 180 partnership with Ben claiming his second century of the season and Wells finished the innings on 277 for 3. Layton Ball (4 for 44) was the surprise package doing the job with the ball as Taunton were bowled out for 190. After a washout against Weston, Wells still had work to do if they were to win the league. They hosted Frome next, and only mustered 168 all out, but the bowlers all chipped in and Williams finished with a wicket maiden to ensure Wells won by 9 runs. Away to Bridgwater the home team mustered a decent 162 all out. The reliable Ben Stacey (50) alongside the steadying Dredge (20) broke the back of the chase, and Wells eventually won by two wickets which secured the title with a game to go. The Wells juggernaut had the small matter of a derby match to finish the season at home to Cheddar, with Wells desperate to prolong the unbeaten record. Cheddar collapsed to 136 all out. On a tricky pitch Wells were making a complete dog’s dinner of the chase, Vassalli and Ball both contributed with the bat but it took numbers 10 and 11 Wiltshire and Johnson to see Wells to victory by just one wicket in another thrilling game. This ensured Wells won a consecutive league title and incredibly are now on a 14-game unbeaten streak as they look forward to playing in the Somerset Premier Division for the first time in the club’s long history next season.